I like to think of Thrift-ola as a curated flea market which removes the hassle and the stress out of hunting down those special super cute vintage finds. So just like you would at a flea market, once a month in my shop you can have a go at haggling… Oh yeah! To make it even more easy peasy you can haggle with me in any one of these 5 places… leave a comment below or e-mail me at leona@thrift-ola.com or if you follow me on Instagram, Twitter or Facebook you’ll have seen the posts and can make me your offers over there. 1. Choose your method of communication from the list above and contact me with the product name & the price you’d like to pay. 2. If I accept the offer, I’ll let you know and then change the price of the product to what you’d like to pay for the rest of the day – although you’ll have to quickly snap it up before someone else does. 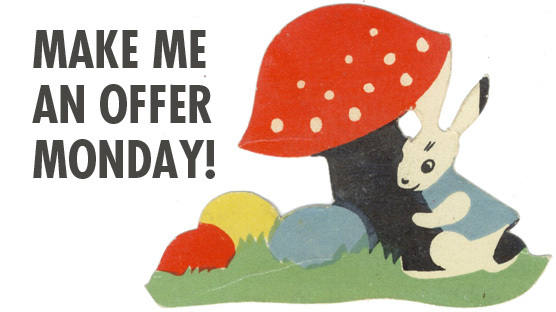 March’s Make Me An Offer Monday will end at midnight 31st March. I would like to make an offer of £4.00 for the set of three flower dessert dishes and an offer of £9.00 for the 1960s sewing box on legs. Hi Leona, I would like to make an offer of £1.50 for the Simpsons glass please.